Was 2016 a successful year for technology in education? 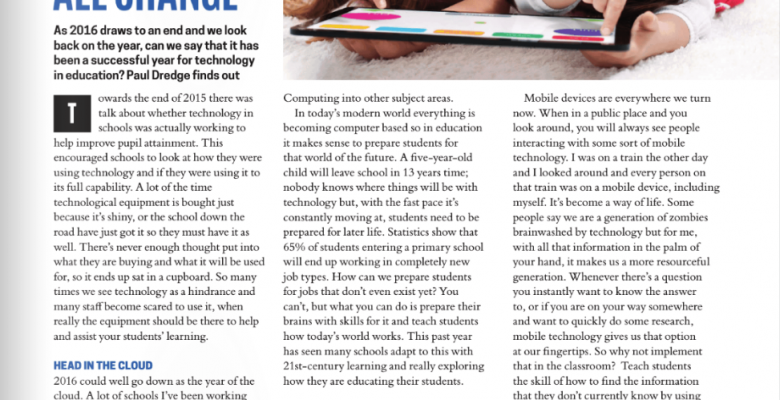 This article was recently featured in Education Technology magazine, which can be found here. As 2016 draws to an end and we look back on the year, can we say that it has been a successful year for technology in education? Towards the end of 2015 there was talk about whether technology in schools was actually working to help improve pupil attainment. This encouraged schools to look at how they were using technology and if they were using it to it’s full capability. A lot of the time technological equipment is bought just because it’s shiny, or the school down the road have just got it so they must have it as well. There’s never enough thought put into what they are buying and what it will be used for, so it ends up sat in a cupboard. So many times we see technology as a hindrance and many staff become scared to use it, when really the equipment should be there to help and assist your students’ learning. A lot of schools I’ve been working with are finally seeing the benefits of the cloud and are slowly making the move to using it. This enables a new way of teaching and learning; it means work can be done from anywhere using any sort of device. It has given children the ability to access their school work from home and is also giving schools the potential to save money when it comes to purchasing technology. This past year has seen many devices come and go, no longer are Apple or Google leading the way with tablets in schools. A lot more schools are realising that buying a Windows 10 tablet is proving to be more productive than an iOS or Android tablet. In many primary schools in the past year I have seen traditional ICT suites and ICT lessons being replaced with devices in the classroom that are always accessible and allows teachers to integrate Computing into other subject areas. In today’s modern world everything is becoming computer based so in education it makes sense to prepare students for that world of the future. A five year old child will leave school in 13 years time; nobody knows where things will be with technology but, with the fast pace it’s constantly moving at, students need to be prepared for later life. Statistics show that 65% of students entering a primary school will end up working in completely new job types. How can we prepare students for jobs that don’t even exist yet? You can’t but what you can do is prepare their brains with skills for it and teach students how today’s world works. This past year has seen many schools adapt to this with 21st Century learning and really exploring how they are educating their students. Teaching using gaming has become more popular in 2016. With the likes of Minecraft and Kodu, gaming is being used to teach children from a different angle. Minecraft can play a very important role in a school, when used effectively. It gives students a whole new way to interact and learn. Moving away from education, slightly, let’s see what 2016 has offered us in the way of technology. One thing that stands out is virtual reality. This past year has seen the pathway laid out for VR and a whole new way of gaming. That’s just the start of it though, Microsoft are about to release the Holo Lens. This will revolutionise how we interact with technology. I can see that VR will really start to make an impact in 2017 and for that to be brought into the classroom excites me. Mobile devices are everywhere we turn now. When in a public place and you look around you will always see people interacting with some sort of mobile technology. I was on a train the other day and I looked around and every person on that train was on a mobile device, including myself. It’s become a way of life. Some people say we are a generation of zombies brainwashed by technology but for me, with all that information in the palm of your hand, it makes us a more resourceful generation. Whenever there’s a question you instantly want to know the answer to, or if you are on your way somewhere and want to quickly do some research, mobile technology gives us that option at our finger tips. So why not implement that in the classroom? I’m not saying we need to replace teachers with technology but maybe we should be teaching students how to maximise the use of technology as a resource and open them up to how it can be used most effectively. So has 2016 shown that it’s been a successful year for technology in education? I think it’s revealed that changes still need to be made to the teaching of computing and the use of equipment to it’s optimum value, but these changes have at least begun to take place.